Little did the organizers of the 1925 Paris Exposition des Arts Decoratifs know that what they were about to celebrate would become one of the most influential styles ever envisioned – a style that would encompass art, architecture, furniture and jewellery Only works demonstrating “new direction and true originality” would be worthy of such an event. The anonymous entries were screened by a committee of mysterious judges, and only upon the spectacular unveiling were the designers’ names revealed on little brass plaques hung beneath their creations. Cartier, Chaumet, Lacloche Freres, Mauboussin, Van Cleef & Arpels, Tiffany and Co. and others ‚Äì all names that endure as much as the style they helped create. There is no questioning the enduring popularity of art deco. Les arts decoratifs were somehow both minimalist and opulent. Art deco design incorporated the clean lines and geometric shapes prevalent in the most mundane household appliance and the most luxurious cruise ships carrying the likes of the bejewelled Astors, Vanderbilts and Morgans across the Atlantic Ocean. Ultimately, the 1925 exposition proved the defining moment of the movement we now call art deco. It flourished and then declined between the two World Wars. 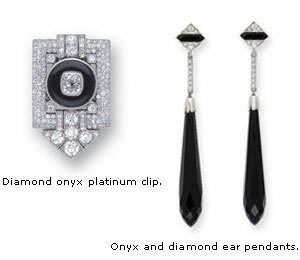 Despite their brief original era, art deco jewels still feel contemporary to our eyes. Moreover, they feel like they will always be contemporary. The desire for new direction was a strong influence, but art deco was largely born out of new technology. After 1920, synthetic sapphires became so easy to produce and were so praised for their durability compared to enamel that many were prominently featured as decorative elements (although some jewellery houses disdained this practice and used only natural sapphires). The diamond saw, invented in 1910, was finally put to use after the First World War ended. But the brilliant-cut diamonds that accented so many jewels owed their proportions not to an old- world diamond-cutter, but to the young American mathematician Marcel Tolkowsky, who published his work in 1919. Tolkowsky’s ideal cut was a sensation. Never before had diamonds been so brilliant. This made for the striking high contrast black and white designs commonly using black onyx with colourless diamonds, or pieces that featured diamonds next to softly coloured pastel coral and enhanced by geometrically-cut faceted rock crystal. Demand for diamond jewellery tripled, seemingly overnight. 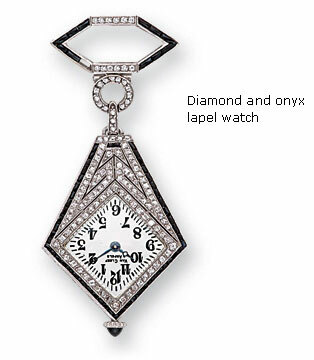 A dominant art deco detail is the use of early ideal-cut diamonds with their broad pavilion facets, a holdover from older cuts. Virtually all fine jewels of the period used platinum to hold the stones in place, thanks to the genius of Louis Cartier himself. A single decade’s worth of technological innovation equipped the jewellers of the world to create an entirely modern look, due to infinite new possibilities of design precision and intricacy. The interplay of these variables created a sleek, streamlined look that enhanced a piece s aesthetic value. Art deco is commonly associated with repetitive geometric designs, pure forms and flat surfaces. Crisp symmetry creates a simple balance that is strikingly stylish. Some pieces also display the exoticism of the Oriental influences that were so in vogue at the time. 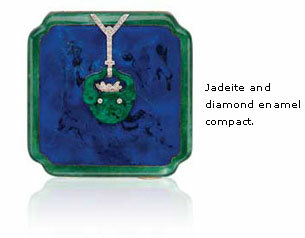 Material choices ran the gamut from expensive, top-quality diamonds to less expensive rock crystal, either faceted or frosted, plus coral and onyx and, to a lesser extent, jadeite. A pleasing combination was created between clear and opaque or bold and softly understated. The surface exhibits more severe and minimalist outlines while accommodating the gemstones in precise settings with finely tuned attention to detail and delicate workmanship. Some other dominant characteristics in the realm of art deco were edgy geometric shapes of ziggurat, stepped and chevron patterns. Rectangle, square, lozenge and mitre shapes were especially popular for lapel watches and in brooches of double-clip design. Diamonds, and indeed most gemstones, were almost always mounted in platinum. White gold is occasionally seen. 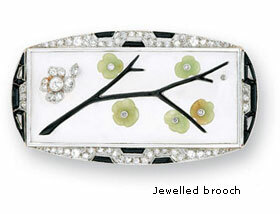 Baguette, square and emerald-cut diamonds all debuted between 1922 to 1925; other cuts are uncommon. For a brief period, all the spirit and enthusiasm of the early20th century found expression in the workmanship of the previous century. It was a convergence born of the Modernist movement that could not last. The mechanization and fascination with efficiency that inspired these designs would soon put an end to them. That little Paris exposition was conceived as a celebration of living in the modern world – and art deco, with its premier quality of techniques and designs, still epitomizes elegant sophistication. Great design not only transcends time; it demands respect and awe. The modernity and originality of these designs is reflected in their timeless and enduring appeal.